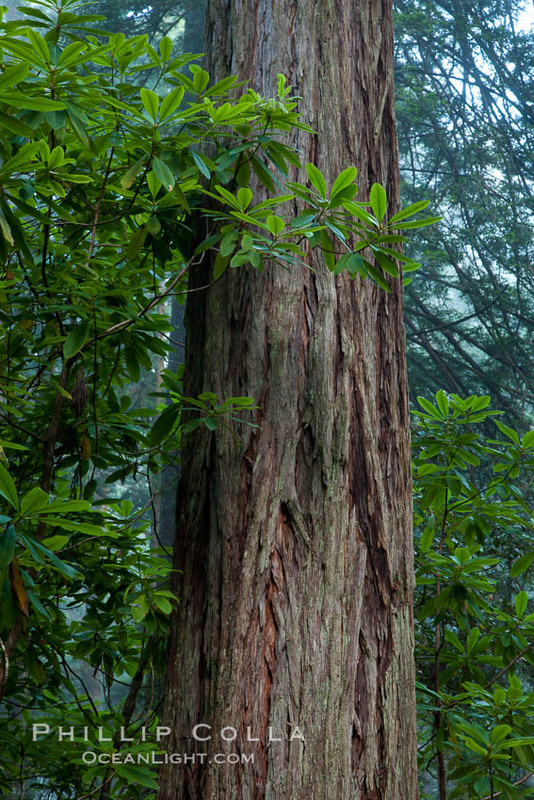 Stock photos of Sequoia sempervirens, the Coast Redwood Tree. Sequoia sempervirens, also known as the Coast Redwood, Giant Redwood, or simply Redwood Tree, is the tallest species of tree in the world. 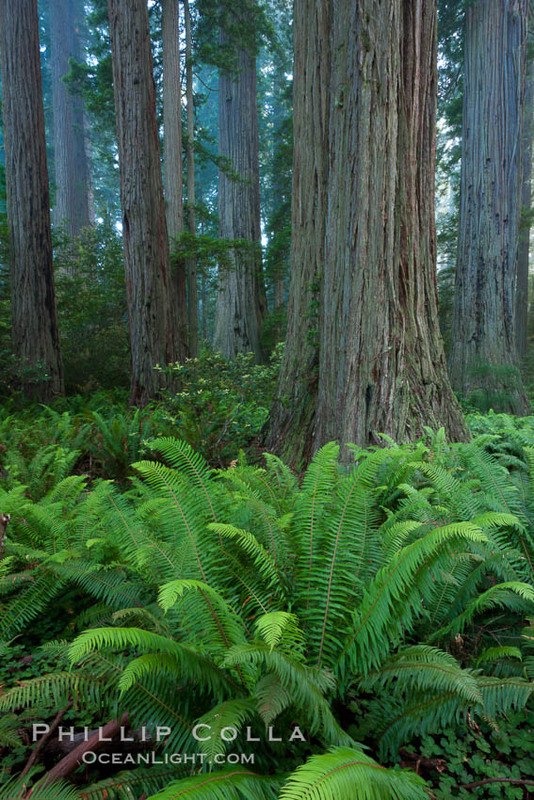 The Coast Redwood tree is the only member of the genus Sequoia, part of the Cypress tree family. Reaching heights of 380′ (115m), the Coast Redwood is also one of the oldest and largest (most massive) organisms in the world, living as long as 3500 years and growing to over 25′ (8m) in diameter and 42,000 cubic feet. The natural range of the Coast Redwood is quite limited, comprising a strip of coastline in northern California and southern Oregon about 470 miles long but extending inland only about 50 miles and typically much less. Coast Redwood trees thrive in this region due in part to the large amounts of moisture that reach the groves through fog that originates over the ocean, as well as plenty of rain (up to 100″ annually). Redwoods that live above the fog layer, and thus only receive moisture in the form of rain and are subject to colder and more arid conditions, are significantly shorter and less massive than those lower and closer to the coast. 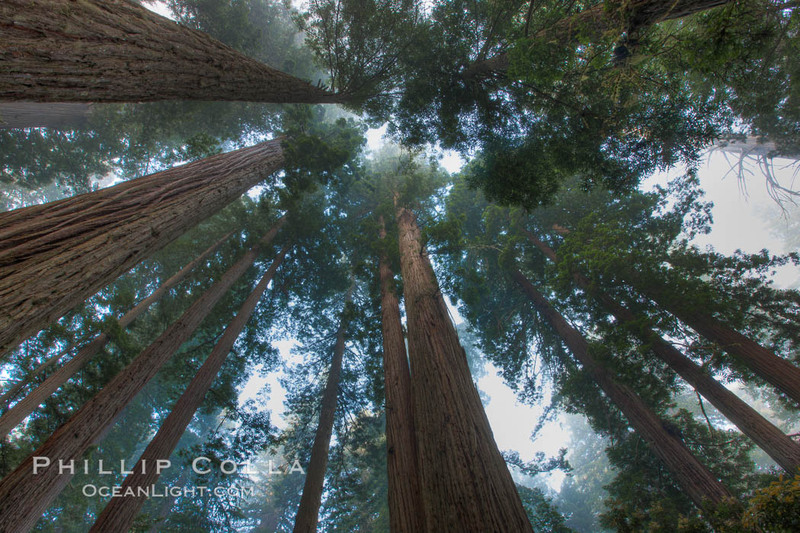 Coast redwood, or simply ‘redwood’, the tallest tree on Earth, reaching a height of 379′ and living 3500 years or more. It is native to coastal California and the southwestern corner of Oregon within the United States, but most concentrated in Redwood National and State Parks in Northern California, found close to the coast where moisture and soil conditions can support its unique size and growth requirements. Coast Redwood trees reproduce sexually through small winged seeds that are dispersed up to 300′ (100m) from the parent tree. Seedlings grow quickly, up to 8′ in their first season. Asexual reproduction is also common, especially when a mature Redwood tree falls: multiple new trees may sprout from the fallen log.